If you’re looking for accommodation in St Andrews, Easter Haining has a huge amount to offer that will make your stay both relaxing and stress-free. With the entire East Wing of the property at your disposal, you will have ample space to unwind in a luxury ‘home from home’. The beautiful bedrooms within this holiday accommodation have each been individually designed and decorated to the highest possible standards to create an ambience of luxury and to make you feel as comfortable as possible during your stay. 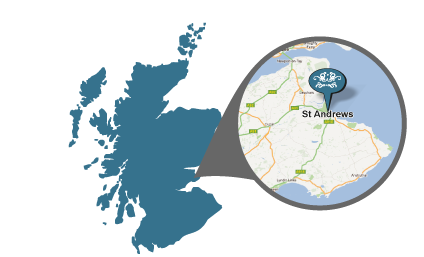 Easter Haining doesn’t just offer a wonderful holiday accommodation; it’s also situated in the West End of St Andrews –arguably one of the prime residential locations in the area. Just 20 minutes walk (or a short bus ride if you’ve had a long day playing golf) and you’ll reach St Andrews town centre. With so many cafes and independent shops to visit, you won’t be disappointed going into the centre to browse or just grab a quick bite to eat. St Andrews town centre boasts some wonderful restaurants for you to pick from and Easter Haining serves an excellent breakfast to get you warmed up for a day of golf or shopping in the morning! Easter Haining offers the option to have bed and breakfast services as well as the privacy of your own wing. Served in the breakfast room, you can expect a beautifully presented cooked breakfast – a great way to start your day of golf, shopping or your exploration of the wonderful town of St Andrews. Browse through our website to find out more about staying in St Andrews and Easter Haining, or use our enquiry form to book your stay or ask any further questions.